[02:52:31] <cradek> hi jmk-wvm. what's wvm? [02:53:38] <jmk-wvm> when its in the middle of the garage and you have to walk around it? [02:55:02] <cradek> I suspect the mill just got pushed back a year at least. [02:57:05] <jmk-wvm> heh- the lathe takes tape? [02:58:56] <jmk-wvm> if you glue it into a mobius strip, will the lathe manufacture a singularity and vanish into another dimension? [03:02:50] <cradek> it has a lot of nice features. [03:05:10] <jepler> but the coolant is still flowing! [03:05:37] <toastyde1th> yep - that's the right thing to do. [03:06:42] <jepler> cradek: to change the subject, I notice that Wolfgang Engineering hasn't renewed his ebay listing for the spindles several days after the last one lapsed. [03:06:44] <jmk-wvm> I was just about to say "heavy feed"
[03:07:01] <cradek> still stringy though - maybe I should have done more. [03:07:48] <toastydeath> oh, well then. [03:07:56] <toastydeath> maybe not 50 ipm. [03:09:54] <cradek> a handful of them at tap sizes will last me a while. [03:15:23] <jepler> cradek has it. [03:23:46] <jepler> G65 is not a valid gcode in emc. if you mean "macro call", then "O- call" may be the facility in emc most similar to what you know as G65. [03:30:48] <jmk-wvm> "global name 'GL_QUAD_STRIP' is not defined"
[03:31:35] <jmk-wvm> minigl is something you wrote for axis? [03:32:08] <jepler> yes. python has to have a wrapper for any platform library it accesses; I chose to write my own for opengl, because when I first started axis the primary one had two important things very broken. [03:35:58] <jepler> OK; that basic pattern will work for any constant defined in OpenGL. adding a function call is a bit more complicated. [04:03:28] <MrSipan> have anyone installed emc2 in gentoo? [09:25:30] <pmbdk> Anyone knows how AP238 i coming along (i.e. in practical terms)? Is it used anywhere? [10:40:04] <anonimasu> anything requiring 8036 pages to describe it bloated by design. [11:44:30] <archivist_emc> #2=[atan[#8]] (debug,angle of helix #2) gets an error missing slash after first atan argument, I note there are 3 atan functions in table 13.3 how is one supposed to use the correct one!!!!!!!!!!!!! [11:56:19] <cradek> heh, I bet 5 would be enough. [12:00:01] <jepler> huh I was pretty certain that the nist rs274ngc spec permitted 2-quadrant atan, but it's certainly not in there now that I look again. [12:53:57] <anonimasu> are 300eur for a 8000ppr encoder good? [12:54:47] <skunkworks_> 8000ppr? wow - 32000 edges? [12:57:17] <anonimasu> I think they are overkill. [14:14:54] <anonimasu> so, the question is do I buy them or not..
[16:01:32] <tomp> this looks like an interesting small machine tool. ancient upside down die cutter ( makes the tapered shaped hole in a die )http://cgi.ebay.com/Antique-Thurston-Schott-Die-Makers-Milling-Machine-1890_W0QQitemZ330255151293QQcmdZViewItem?hash=item330255151293. [16:01:43] <tomp> ﻿( i guess you're follwing scribed lines or a template. All the chips must fall down till you break thru. [16:16:03] <tomp> skunkworks_: the h bridge looks nice, i'm putting some rur's onto a system right now ( rurg8060's damn fast ). not too much xtra to get dir & pwm vs pwm up/pwm down. [16:20:25] <skunkworks_> tomp: they where an ebay deal... I have been playing with them for a while. No issues. [16:21:39] <skunkworks_> the mosfets have a pretty high rds - so they are not good for much over 20a even though they are rated at 44 or so. [16:41:10] <jepler> anonimasu: have you compared to usdigital.com encoders to see if the 300EUR is a reasonable price for what you're looking at? [16:46:09] <anonimasu> thoose are software scaleable..
[16:56:18] <SkinnYPup> Hi guys, I've got a laptop I just upgraded from fiesty to 8.04, installed emc via the installation shell script. Wireless broadcom works under the generic kernel, but doesn't appear in administration, network with the RT kernel. It's for sim only so I can escape the garrage, what do I need to do to get my wireless working with the rt kernel? [16:56:43] <cradek> for sim you don't need the realtime kernel. [16:57:41] <skunkworks_> cradek: is your lathe running? Is it 3 phase? Convertable? [17:00:02] <anonimasu> jepler: 247$ for a rugged encoder..
[17:01:20] <anonimasu> without a connector..
[17:01:28] <anonimasu> jepler: my deal looks better..
[17:02:42] <jepler> SkinnYPup: to be more specific: in /etc/apt/sources.list, change emc2.2 to emc2.2-sim, then using the package manager update your package list and install the emc2-sim package. [17:03:22] <cradek> skunkworks_: I have not hooked anything to power. It is 3 phase so far. It is a very good candidate for conversion except it currently has resolvers. [17:03:51] <skunkworks_> did you look to see if they have resolvers and tachs on the motor? [17:03:57] <jepler> you may have to use the package manager to uninstall the emc2, rtai-modules, and linux-image-2.6.24-16-rtai packages before doing that -- almost certainly you have to uninstall the emc2 package. [17:04:08] <cradek> skunkworks_: not yet but I'm pretty sure it does. [17:04:35] <rayh> The motors on a Hardinge HNC don't have any feedback. Feedback is on the ballscrews. [17:05:27] <SkinnYPup> Jepler Cradek , Thanks! I'll chance to emc2.2-sim and reinstall it .. it was giving me errors about rtai_hal.ko in the generic kernel. [17:06:02] <anonimasu> I think I'll buy thoose encoders. [17:06:09] <SkinnYPup> change, to emc2... typo "chance"
[17:07:01] <anonimasu> I end up paying 25% tax on what I buy from the us too..
[17:08:45] <anonimasu> well, the same applies here too..
[17:11:16] <anonimasu> heh.. the connectors for the encoders are 63 eur. [17:12:15] <anonimasu> with bought disk? [17:13:23] <skunkworks_> * skunkworks_ was showing off the TURBO SW and HDDLED connectors. [17:14:18] <skunkworks_> automation direct has some 'sealed' ones..
[17:14:23] <skunkworks_> have you looked at them? [17:14:39] <skunkworks_> * skunkworks_ doesn't know how sealed..
[17:17:19] <anonimasu> + shipping and stuff..
[17:21:48] <PuPpY> jepler: Changed the sources.list to"deb http://www.linuxcnc.org/hardy hardy base emc2.2-sim , and deb-src http://www.linuxcnc.org/hardy hardy base emc2.2-sim" but get the following synaptic error "Failed to fetch http://www.linuxcnc.org/hardy/dists/hardy/Release Unable to find expected entry emc2.2-sim/binary-i386/Packages in Meta-index file (malformed Release file?)" [17:28:05] <PuPpY> aaaahh , hmm .... Then I guess I'm back to trying to get the wireless to work in the rtai kernel. Wireless works fine in the generic kernel but doesn't appear in the network config with the rtai kernel booted. Suggestions ? [17:35:41] <fenn> and then compile sim as usual. carry on! [17:41:30] <SkinnYPup> MMmm lunch was good! Thanks fenn! [17:47:03] <skunkworks_> SWPadnos: where are you? [17:47:15] <SWPadnos> home, how about you? [18:01:50] <skunkworks_> SWPadnos: was the trip fun? [18:15:15] <rayh> jepler, What did you want to check on Hardy? [18:15:49] <jepler> rayh: earlier I tried to give puppy instructions for installing the sim (no rt kernel) packages on hardy, but it didn't work. SWPadnos says that the packages aren't even in the repository, so there's not much to check ..
[18:21:30] <lerneaen_hydra> When coding for a PC or other large system and defining variables, what's the normal way of defining types? use standard int/double/float/char if you don't depend on the bit-length, and expressly defined types (uint8_t for example) when you depend on bit-length for rollover or other similar things? [18:24:28] <lerneaen_hydra> what do you personally use? [18:34:58] <lerneaen_hydra> hmm ok I see. so typically you'd only be concerned with the size when working with arrays and other constructs? [19:18:34] <skunkworks_> well crap. 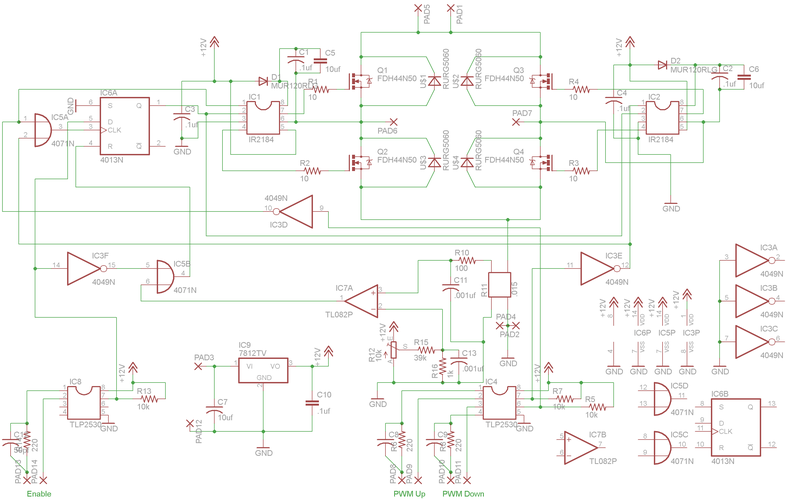 I can't tie the op-amps -supply to ground and have it work as a comparator. [19:20:59] <skunkworks_> *when I am trying to compare milivolts. [19:23:14] <skunkworks_> it works as expected when I run -supply atleast a few volts negative. [19:24:56] <anonimasu> this is why you need rail to rail opamps..
[19:26:25] <anonimasu> welll, thoose work but you need more supply then you want to output..
[19:37:01] <dmess> who can help me with some ssl issues?? [20:01:23] <archivist> thats a good fix! [20:58:52] <Roguish_> cradek: i have home_search_vel=20 and when i home the axis the screen (axis gui) shows the vel=120 ? what gives? [20:59:53] <Roguish_> well that would explain it. thanks. [21:17:14] <dmess> how do i modify the homing sequence in the SIM lathe module?? [21:30:17] <owad> Hello, I'm setting up EMC2, to use with my router/mill. At the Parallel Port Setup screen, are the "Invert" checkboxes what I use to make a pin active-low? [22:09:18] <owad> My X axis moves about 6 inches when it should move 10... I have my drivers set to 1/4 microstepping. Should "Driver Microstepping" therefore be set to '4'? [22:28:07] <owad> a 1/2-8 leadscrew has 8 rev/in, right? [22:28:17] <owad> I'm not seeing much here that could be wrong. [22:36:16] <rayh> sounds like you've got the idea. [22:36:57] <rayh> Does the axis move back to zero after the 10 inch command? [22:40:30] <owad> I'm doing 'Test this Axis' with a test area of 10". It moves out about 6 inches, back to 0, and repeats. [22:41:29] <rayh> And the motor is direct drive? [22:44:28] <rayh> 200 steps per rev? [22:45:08] <cradek> are you sure it's 8? [22:45:36] <rayh> What drivers are you using. [22:50:11] <owad> I think it's 1/2-13, and 8/13 = ~.6, so that makes sense with the measurements I'm getting. Thanks! [22:50:31] <owad> rayh: I'm using Keling KL-4030 drivers. [22:50:52] <owad> and I can't find any notes on what set time, step space, direction hold, or direction setup times I should use. [22:51:01] <cradek> oh it's just triangular, not acme? [22:53:50] <rayh> 40% more than 8tpi is about 13 so I'd try that and see how it comes out. [22:55:19] <rayh> I saw some specs on those drives and the timing was good. I'd think the default for those parameters should easily handle them. [22:58:18] <rayh> I don't believe I've seen one of those lathes. [23:02:45] <rayh> Got specs on the 23 motors? [23:05:25] <dmess> did i get robbed?? [23:06:55] <rayh> The motors are 90 ounce inch so not a lot. [23:07:19] <rayh> But they are about the size and probably the same maker as the ones I used on my little grizz retrofit. [23:08:37] <rayh> I used a 3/1 belt reduction and 5tpi ball screws. [23:09:08] <rayh> Funny story. A guy at NAMES show said the motors were much to small. [23:09:45] <rayh> Told him to try and stop x during a move. [23:10:11] <rayh> He wound up pushing hard enough that the x movement slid the whole mill across the table. [23:10:31] <rayh> What TPI is the existing acme? [23:10:33] <dmess> oh yean and power..
[23:12:20] <dmess> im pretty sure the handle is geared..
[23:12:42] <rayh> acme is less efficient than ball but with a bit of reduction between motor and it should should be able to make it move.